6.5 x 15" 8 x 19"
Buy More Wine Organza Bags Save More! 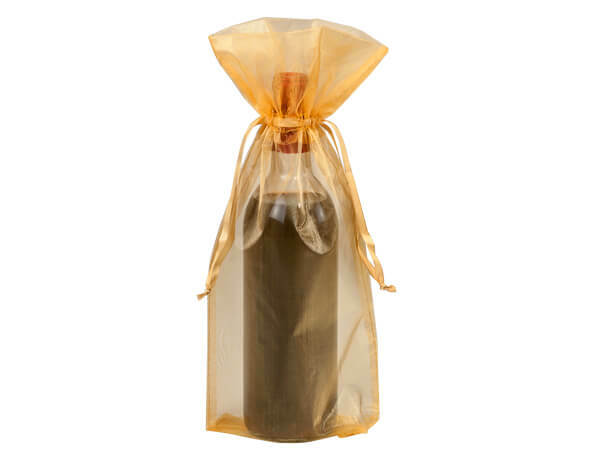 Gold Sheer Organza Wine Bags with gold satin drawstring set 3" from opening top. 100% Nylon. Tall sheer bags are perfect for wine bottles, gourmet condiments, candles, shampoo bottles, lotions, bath & body products and other tall or odd-shaped gifts. Bags are imported 100% nylon and PVC free; colors may vary slightly from shipment to shipment.